Field Tests for Brick Earth. (1) Test for the Consistency of Soil. (2) Test for determining Molding Properties. (3) Test to determine deformation on Burning. Stage 2: Preparation and Tempering of MUD. Stage 3: Moulding of Bricks. (1) Hand Moulding of Bricks. Types of Hand Molding of Bricks. The process of manufacturing of bricks is carried out in a number of stages. These are listed below. Each stage has its own specific importance. Stage 1. Selection of the suitable type of Brick Earth. Stage 2. Preparation and Tempering of Mud. Stage 3. Shaping or Molding of brick units. Stage 4. Drying of molded bricks. Stage 5. Cooling and Burning of bricks. Good quality building bricks can not be made from every type of earth or soil. As a general statement, it may be said that any soil (earth) which contains four parts of clay and one part of sand is suitable for making bricks. (1) Alumina (20-30%). All clays are basically hydrous aluminum silicates. Clays are responsible for the plastic character of the mud. If they are present in higher proportions, the brick will shrink on drying (and develop cracks). If they are present in smaller proportions, the brick will not be molded easily and nicely. The above percentage of alumina ( 20-30%) imparts the bricks sufficient plasticity. (2) Silica (50-60%). This is present in two forms: the silica combined as a constituent of clay, and, the free silica (sand or quartz). The total proportion of silica should form about 50-60 percent. (It is why the actual clay content and free sand content has to be broadly in the ratio of 4 : 1 in the good brick earth). Silica is responsible for strength, hardness, and resistance to shrinkage and shape of the brick, and, also to a great extent, for its durability or long life. But if we add too much free sand in the brick earth and thereby raise the proportion of total silica in the earth, resulting bricks would be very brittle and porous and may not burn easily. (a) it would not be more than 4% because in that case, it may cause excessive softening of bricks on heating (Lime and Magnesia act as fluxes). (b) it must be present only in a finely powdered and thoroughly dispersed form. Otherwise, if present in small grains or nodules, the lime itself will get slaked (heated) and once the brick is used, it (lime) will easily get hydrated and cause disintegration of brick. Magnesia, which is invariably associated with lime, also has a similar effect. It is their total percentage which must be considered while determining the composition of the brick earth. (4) Iron Oxide (4-6%). Like oxides of calcium and magnesium, iron oxide also acts as a flux, i.e. it lowers down the softening temperature of silica. The iron oxide has, in addition, another important function: it imparts the red color to the bricks. The excess of this oxide will make the bricks too soft during burning (where there is a risk of deformation) besides making them darker in appearance. A shortage of iron oxides in the earth will affect the final color of the bricks: instead of being brick red, they may be yellow or light red. (The yellow color may also be due to incomplete burning of bricks). Besides the above desired essential constituents of good brick earth, there are some materials which should not be present in the good quality brick earth at all, even in a small percentage. They are listed below with their harmful effects. (1) Lime Nodules. Free lime nodules will hinder in proper burning. They will also adversely affect the quality of final brick. (2) Organic Matter. This includes roots of grasses, leaves and other vegetable matter. Such matter will affect the quality of brick if left incompletely burnt during the process. (3) Sulphides and Sulphates. Iron sulphide in the form of Pyrite and alkalies in the form of potash and soda are some other common impurities present in many soils. The effect of iron sulphide is that it creates disintegration or cracking in the brick during the burning stage. In the case of alkalies, besides their pronounced flux-action similar to lime and magnesia, they are liable to stay back in the final brick. When such a brick is used in a building, the alkalies absorb moisture from the atmosphere very easily. They get dissolved into it and when this water is evaporated from the surface, they reappear in the form of a scum or encrustation or patches of white salt. This phenomenon is called, efflorescence is a common cause of dis-figuration of such a brickwork made from alkaline soils. Silica (Total, free and combined 50-60% ). The earth should be free from alkalies, organic matter, free lime and organic matters as far as possible. So the above is the first step of bricks manufacturing. Read More: Properties of Bricks | A Complete Guide. When a major brick making unit is to be established, it is always advisable to go for a thorough survey of the brick earth deposits. That will include mapping their area and volume and carrying out their chemical analysis. The first step will assure the total quantity of the brick earth available and the second, its quality. Small balls are made from the soil by mixing with appropriate quantities of sand and water. These balls are allowed to dry in a shaded place. When completely dried, they are studied for any deformation in their size and shape, and appearance of cracks. When the soil is of a suitable type, the balls should show no cracks or shrinkage effect. If shrinkage effects are observed, new balls are made by adding more clay or more sand or adjusting quantities of water. This is done to see if the soil properties can be improved by adjusting the main components: clay, sand, and water. By trials, a right proportion of the constituents may be found which will make a good quality of earth for the manufacturing of bricks. In case all trials give same negative results, then the clays are not suitable for manufacture of bricks. This test is usually carried out on the soil that has passed the first (consistency) test. The soil is kneaded very thoroughly in the presence of some additional quantity of water. A homogeneous mud is thus made ready. From this mud, thin threads (about 3-4 mm thick) are made by rolling between the palms of two hands. If thin threads can be rolled and these do not break on acquiring good length, it shows the clay is of good plastic nature. (Otherwise, threads will break on rolling to small thickness). From the mud so prepared, TEST BRICKS are made and allowed to dry. If their corners and edges are well formed, the soil is assumed to possess satisfactory molding properties. Such shapes must be retained by the test bricks even on drying. Presence of fluxes in greater or lesser proportion cannot be tested by the first two tests. So, it is essential to subject the bricks made from the above soil to Burning Test. Such bricks should be, of course, properly dried before doing so. These dried test bricks are burnt in a potter’s kiln for three to five days. If after burning and subsequent cooling, the bricks retain the uniform shape and develop the brick red color and have a good appearance, the earth is said to have passed this test also for the manufacturing bricks process. Then, the soil composition is defective with respect to one or another of the essential ingredients. The soil may not be suitable for manufacturing of bricks of good quality without proper investigations and treatment. These tests are carried out on a series of test bricks made from the soil as above and which has already passed all the three tests. These tests can be carried out approximately in the field, or, even in the laboratories. The test involves dropping the bricks, one by one, from a height of 2-3 meters on a hard dry ground below. Good quality bricks should easily withstand this shock without breaking. For the laboratory testing, the test specimens are subjected to routine testing in a well-equipped civil engineering laboratory for compressive strength, bending strength and water absorption. A series of steps are necessary before the earth is ready for moulding of bricks. The area selected for the brick-earth is first cleaned or unsoiled at the top. (i) Surface digging, by using hand tools, This is the most common method followed in most countries. (ii) Mechanical excavation, by using heavy machines called excavators. This method is applied to large-scale mechanized brick making and especially when the earth is hard and compacted. After the removal of soil, the clay is spread in heaps and layers over the ground for weathering or seasoning. During this period, it is also cleared of any pebbles, stones and lime nodules. Moreover, any clay lumps are broken into a fine powder so that a uniform-sized seasoned earth is prepared. It is at this stage of seasoning or weathering that any additional component (sand/clay) is mixed with the brick earth to alter its composition to any desired degree. The seasoned clay is said to be ready for conversion to mud by mixing with appropriate quantities of clean water. These Operations of selecting the earth, clearing and digging it, spreading it for weathering are together called as winning of clays. Tempering means converting of the prepared brick earth into a homogeneous mix of the desired plasticity by mixing it thoroughly with proper quantities of water. This is done either by manual labor or with the help of a specially designed, mechanical device called pug mill. In manual tempering, the clay is thoroughly kneaded under feet (of either men or cattle) with gradual additions of water till desired homogeneity and plasticity are obtained. Machine Molding: When specially designed machines are used for moulding of bricks. In most countries, even today, the most common method of moulding of bricks are hand moulding. In the advanced countries, however, mechanized brick making is the main process for large scale manufacture of bricks. In hand moulding, the quality of the tempered clay is invariably soft, so that it can be molded into the required shapes conveniently. The mud contains more water (18-25 percent by weight) than what is used when machine molding is to be done. It is for this reason that this method is sometimes referred as SOFT MUD PROCESS. Bricks are shaped from such a soft mud by hand either on a specially prepared ground (called ground moulding) or on special tables (called table moulding). Tools: The essential tools used in the hand moulding process are: a brick mould, cutting wire or strike, wooden plates called pallets, and a stock board. The mold is made either of wood or steel. Its inside dimensions are slightly bigger (about 1/10th) than the desired dimensions of dry bricks (because bricks will shrink on drying due to loss of moisture). It may be a Single-unit mold or a multiple-unit mold. The stock board also called molding block, is a small wooden block, slightly bigger in dimensions than the mold and with a raised central projection carrying the identification mark (frog). The pallets are thin wooden plates for handling green bricks. The strike made up of wood or metal has its one edge quite thin to slash surplus mud; cutting wire is meant for the same use. There are two types of molding used in the manufacturing of bricks. At present, this is the most common method of moulding of bricks in most countries. In this process a piece of land (the ground) is first cleaned, then thoroughly leveled and often made smooth by plastering. Some sand is sprinkled uniformly over it to make it non-sticky. There are two variations of ground moulding. (a) For making ordinary, rough-faced bricks without any frog or identification marks on them. The mold is either first dipped in water (slop molding) or some sand is sprinkled on its inside surfaces (sand molding). This step is necessary to avoid sticking of the mud to the sides of the mold. Then, the mold is placed on the ground. A lump of mud is dashed into the mold by hand. Care is taken to see that mud reaches the edges and corners of the mold. Any surplus mud is then removed by using either the strike or the cutting wire. After this, the mold is lifted up with a jerk. The molded brick is left behind on the ground. The moulder then keeps the mold at the next place. The moulder repeats this process. The face of the brick which rests on the ground will be naturally rough and without any identification mark. (b) For making smooth-sided, frogged bricks. This requires a stock board and pallets, The stock board has a raised projection (6 mm) carrying impressions or marks of the manufacturer carved out in it. For moulding of bricks using the stock board, the mold is, as usual, either first dipped into a bucket of water (slop molding) or, some sand is sprinkled on its inner sides (sand molding). This (mold) is then placed on the stock board with projection in the center and a lump of prepared clay is dashed into it. Any surplus mud is removed by using the strike or cutting wire. A pallet is then placed on the top of the mold and the stock board is turned over. Thereafter, the mold is lifted up, leaving the molded brick on the pallet below. Another pallet is placed on the upper surface of the green brick and it is taken to the drying field, where it is placed first on its edges to dry. The pallets are thus available for use again and again. This process, where pallets and stock board are used is called rightly pallet molding. It is also a type of hand-molding method. The moulder carries out all the operations of pallet-molding on a table of suitable dimensions and while in a standing position. Such a table is large enough to accommodate all the materials required in the hand moulding, namely: a stock board, molds, cutting-edge bucket full of water or sand and supply of tempered mud. The process is similar to pallet-molding on the ground. dashes a lump of mud into it, presses it thoroughly, cuts any surplus mud with the strike, places a pallet over the mold and turns it over. The molder then removes the mold by a jerk leaving the brick on the pallet. A helper places another pallet on the brick so molded and carries it away to the drying ground where he makes the brick stand on edge. The pallets are thus available for use again. Although initial cost is little higher in table moulding, it is considered more efficient. In advanced countries, machine moulding is an essential part of the Mechanized brick making plants. It is both cheaper in the long run and gives bricks of uniformly good quality. There are two broad types of processes used in machine moulding: first, stiff mud process and second, dry press process. Since we are fast progressing towards modernization in all sectors, it is appropriate to understand the basic principles of both the processes. STIFF MUD PROCESS: The clay is mixed with only a small quantity (8-12%) of water during tempering so that it is quite stiff in consistency. This stiff mix is then made to pass out under pressure from a molding machine. Two versions of molding machines used in the STIFF MUD PROCESS. The first type of molding machine consists of a feeding chamber provided with a worm gear to apply pressure. It has a hopper at the top to receive the clay mix. On the front narrow end, there is fixed a die of thickness and height of a brick. It is provided with a conveyor belt on a set of rollers and cutting wires adjusted in front of the die. For operating this machine, properly tempered stiff clay is fed into the chamber through the hopper. It is then forced forward using the worm gear. Under this pressure, the clay comes out through the die in the form of a continuous rectangular ribbon having the height and width of the bricks. It is then cut into brick-lengths. This is done by allowing the ribbon to pass on the belt-carrier from under the cutting wires adjusted for brick-length-distances. The lengths are cut either edge-wise or side-wise depending on the orientation of the die in the machine. This machine can mold 1000-2000 units per hour. The second type of a brick-molding machine is a Vacuum Press commonly used in USSR. Operation of such a machine is simple. The feed of properly mixed clay is supplied to the cylinder. It is then pushed into the vacuum chamber with the help of body screws through the perforated portion in the vacuum chamber. This mass is de-aired and then crushed by operating crusher. Thereafter, it is made to pass through the die by operating the crushing screw. It comes out from the die in the form of a continuous ribbon, which has the width and thickness dimensions of a brick. The brick-lengths are then cut from this ribbon by using knives or wires. The main advantage of this type of vacuum-machine is that de-airing of clay before pressing through the die results in bricks which are more denser and hence stronger. They are, therefore, least porous and most suited in places where moisture absorption by bricks is a common cause for deterioration of bricks. DRY PRESS PROCESS. It is yet another common method for moulding of bricks in mechanized brick manufacturing making plants. In this method, only a very small quantity of water is added to finely crushed and thoroughly cleaned clay. So that the resulting clay mix is not a plastic or stiff mud but just damp enough to take a shape under pressure. Such damp clay is fed through hoppers to special brick molds. This clay in each mold is then pressed hard through a plunger using pressure in the range of 50 – 150 Kg/cm2 . Such a pressure is sufficient enough to convert the loose damp clay mass into a dense, very compact brick unit. Which is then removed from the mold. Such bricks are appropriately called PRESSED BRICKS (rather than moulded bricks). They require practically little drying before burning. Moreover, they have perfect shapes on all the sides and edges and corners. Read More: Full Guide on Fire Brick OR Refractory Bricks. After molding, the green bricks have to be dried. This is necessary for three reasons. . .
Firstly, to make them strong enough for rough handling during subsequent stages as for examples for stacking etc. Secondly, to allow a slow loss of moisture from the brick without disintegrating the unit. If a green brick is put to direct burning in a kiln, the rate of loss of moisture will be so fast that the brick will crack during the burning process. Thirdly, to save fuel during the burning stage, a brick containing 20 percent moisture will require more fuel to burn compared to a brick containing only 2-4 percent moisture. Drying of bricks is achieved either by natural methods or by artificial methods. Pre-stacking stage, where the molded bricks are first laid edgewise, side-wise and flat for 2-3 days so that they become hard-enough to handle without losing shape or breaking. Stacking Stage, in which the hard bricks from the first stage are arranged in well-made layers, one layer above another. 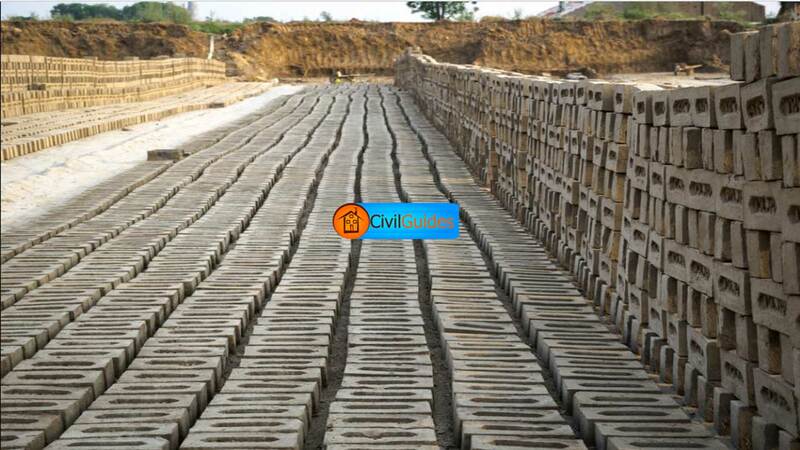 Stacking in the manufacturing of bricks is done in specially prepared drying grounds. Each stack may be about 20 cm wide and as long as the ground allows. The height of the stack is generally of about ten bricklayers. Enough space is left between the individual bricks in a stack and also between the different layers for easy circulation of air. It is absolutely necessary that drying should be done in stacks that are properly protected from direct sun and rain. Air drying by staking may take 4-12 days for reducing the moisture to 2-4 percent in the brick. This depends on time and place of drying. The Artificial Drying. This method becomes essential in mechanized brick making plants. It is only by this method that the drying of bricks can be ensured throughout the year independent of weather conditions. Artificial drying may be done either in specially designed chambers or in tunnels. In the chamber drying, bricks are arranged in stacks with sufficient spaces in between them for free circulation of air. Hot air under controlled conditions of temperature and humidity is made to circulate through these stacks for 2-3 days or more. The dried bricks are then taken out and next batch loaded in the chamber. In the tunnel driers, the brick-stacks are made on vehicles that travel on rails within a drying tunnel. The tunnel is divided into compartments and the stack-loaded vehicles is made to enter from one end, stay in each compartment for a prefixed time and come out of the other end. This process may again take 1-3 days for a car-load of bricks to dry to a required moisture content. The sun-dried bricks, also called ADOBE are poor man’s construction material even during the present time in many countries of the world. These bricks, when protected from rain, are strong and durable enough to sustain loads of small units in villages. This stage of manufacturing of bricks is absolutely essential to develop in them the desired building properties such as sufficient strength, hardness, durability, and resistance to decay and disintegration. At least three chemical changes are known to take place in the brick-earth during the burning process: dehydration, oxidation, and vitrification. Dehydration. 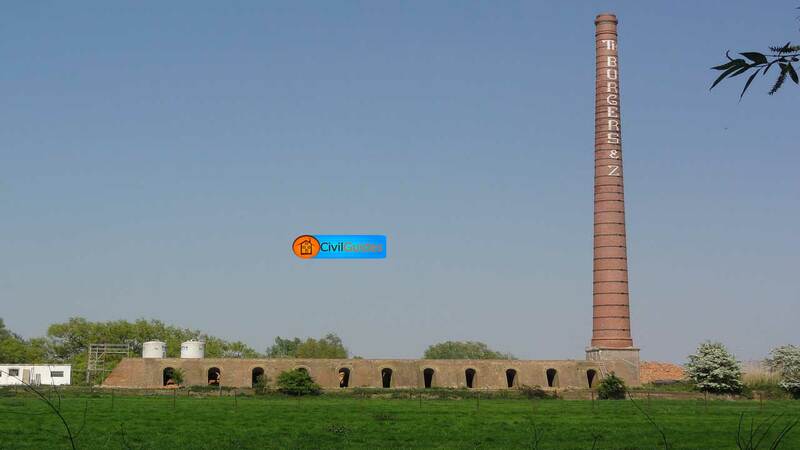 It is completed within the temperature range of 425 – 750° C. Bricks heated to this temperature lose all the free water and most of the water of crystallization. Oxidation. It also starts within the above range or temperature and is completed at about 900°C. All the organic matter in the brick-earth gets oxidized; carbon and sulphur are eliminated as oxides. The fluxes ( lime, magnesia, and iron) also become reactive at this temperature. The brick acquires the red color due to oxidation of iron in the clays. Vitrification is the extreme reaction that takes place from 900°C to 1100°C or so. The constituents of brick clay, that is alumina and clay, start softening in the presence of fluxes and getting bound together firmly. In fact, this is the change which makes a brick a strong and hard unit. But when the brick is heated to the extreme temperature of vitrification, the fluxes may actually cause considerable softening of the essential components of the brick earth. At that stage, the brick may lose even its original shape and get distorted at edges and corners. Hence ordinary, building bricks are not heated to very high vitrifying temperatures. Cooling: In this stage of manufacturing of bricks, The burnt bricks are placed for some time to be cooled before using it in the construction. Thanks for Reading. Don’t forget to share it. Is there any way I can preserve soil made bricks apart from burning them?